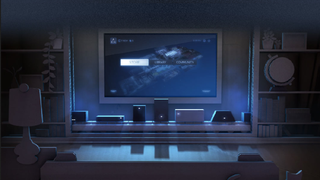 The much-anticipated living room PCs, which have been MIA since Valve officially announced them in early 2014, will finally launch this November alongside a special Steam controller and a device called the Steam Link that will allow for game streaming from a PC or Steam Machine at 1080p/60HZ, according to the folks at Valve. The Steam Link and Steam Controller will each cost $50. The concept of the Steam Machine has always been a bit nebulous, but essentially, Valve is teaming up with hardware manufacturers to release a variety of different living-room gaming PCs that will be available at various price points. The lowest, it seems, will be in the $350-400 range, and if you take Valve at their word, it'll be more powerful than the PS4 and Xbox One.